Ever considered putting CAFNEC in your Will? Formed by concerned community groups in 1981, Cairns and Far North Environment Centre acts as conservation council for the region from Cardwell north to Torres Strait and from the east coast to the Gulf of Carpentaria. For more than 35 years member of the CAFNEC has worked to protect the rich natural environment of Far North Queensland. CAFNEC works to protect the environment by enhancing the capacity of local groups and community members to act for conservation. The sustained efforts of CAFNEC volunteers over the years have been inspirational, and the few paid workers are vital to CAFNEC’s success. The environment of Far North Queensland needs a strong voice, and the people of FNQ who know, love and live in the region are the best ones to be that voice. Protecting the world’s largest living structure (the Great Barrier Reef) and the oldest continuously surviving rainforests (the Wet Tropics) – as well as the other spectacular natural areas in the region – is a huge challenge and needs resources. 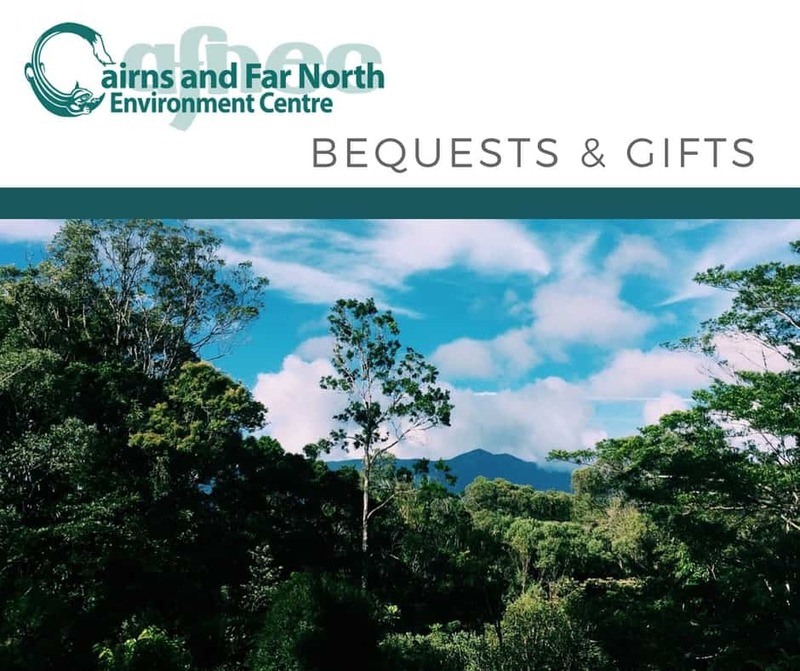 A bequest to Cairns and Far North Environment Centre will support CAFNEC’s long term objectives and make a lasting contribution to the protection of the Far North’s natural heritage. A bequest can be large or small, any gift will make a difference. To make a bequest you must make or supplement your Will, as it is necessary for Wills to comply with a number of legal requirements. Your Will is a very important legal document and Cairns and Far North Environment Centre advise that you consult a solicitor or the Office of the Public Trust. Appropriate wording of your Will is crucial. For your bequest to be valid the organisation’s full name, i.e. Cairns and Far North Environment Centre Incorporated, must be used. If necessary your solicitor or trustee company can contact us to discuss your wishes or request further information. After providing for family and friends you can choose to leave what remains (residual) to Cairns and Far North Environment Centre. Regular review of your Will is recommended to account for changes in your estate or compensate for inflation. A specific cash amount is another form of bequest that allows you to nominate a certain quantity of money. Regular review of your Will should be made. You may decide to share your estate among a number of charities by allocating a percentage. In this case your Will does not need to be reviewed regularly. Cairns and Far North Environment Centre Inc.